No extra safety measures are required, allowing existing designs and layouts to be retained. EPCOS, represented in Australia by Ramelec , has released the B37941X, a ceramic capacitor that minimises the risk of short circuits if the capacitor is damaged. It is suitable for applications in which the capacitor is permanently connected to the positive pole without extra safety measures. This is the case in automotive electronic circuits connected to terminal 15 or 30. Ceramic capacitors installed in automobiles are exposed to particularly high mechanical and thermal stress. Flexural rupture of conventional capacitors may lead to contact between electrodes of different polarity with the resulting dangers of local overheating and fire. The module affected fails and the battery is discharged at the same time. The capacitor is connected in series, reducing these risks significantly. No extra safety measures are required, allowing existing designs and layouts to be retained. The internal structure of the component is based on two capacitors connected in series. Even if one of these should fail due to a short circuit, no short circuit occurs in the overall component. The B37941X is available in size 0805 and ceramic material X7R. Types designed for a rated voltage of 100V cover the capacitance range from 1nF to 100nF, while those for 50V deliver 33nF to 100nF. With voltage derating the components may be operated at temperatures up to 150°C and conform to AECQ200. 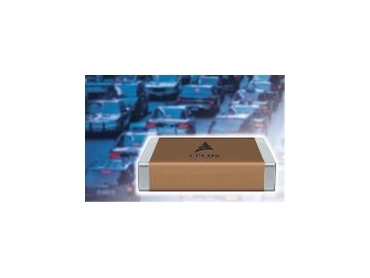 The new capacitors are suitable for all portable electronic equipment and industrial electronics as well as for automotive applications.